Additional possibilities illustrate ability of a kernel of the program to processing of the information on the basis of directories and typical algorithms. 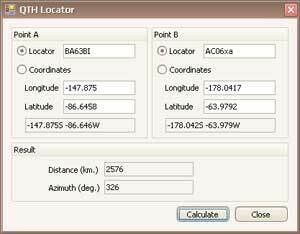 The program carries out calculation of the parametres defined through locators, on the basis of the trigonometrical formulas considering sphericity of the Earth. 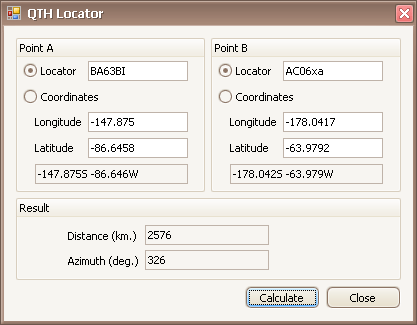 The result of calculation can differ from the result received under simplified radio amateur tables. The divergence that more than is more distance between locators. This divergence does not influence result of competition as it is applied equally to all participants, and though the quantity of the typed points can differ from calculation under the simplified tables, does not influence distribution of places in tournament. Directory CTY is included in program structure (a file cty.dat http://www.country-files.com). The directory is supported in an actual condition by its developer, the program joins its new versions in process of their publication. 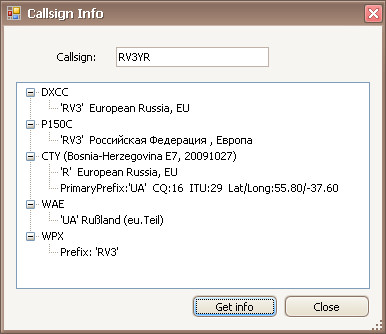 The version and date contain in the file cty.dat, they are displayed in a window of the information on a call sign or at directory opening in the program, in the panel of messages. The directory is supported in an actual condition by its developers, the program joins its new versions in process of their publication. 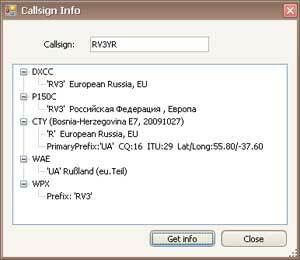 At extraction WPX of a prefix the standard rules which do not cause difficulties in case of trivial call signs are used, but sometimes do not allow to allocate correctly a prefix from difficult compound or erroneous call signs. Besides, in the radio amateur environment there is no common opinion how in these cases to define a prefix. Please inform the noticed discrepancies in prefix definition if those will find out, for the analysis and, probably, entering of amendments into algorithm.